Quail are related to grouse, pheasants and turkeys, and to some people, they look like a small, plump chicken. They walk upright on short legs, with a pushed-out chest. Males and females can be distinguished by the feather coloration on the head. The male has a white patch under his neck and a white line that runs above his eye. On the female, those feathers are light brown. The body feathers of both sexes are a beautiful but subtle combination of brown and black and buff and white. Their coloring provides effective camouflage. Quail live on the ground, both day and night. At night, they hide under weeds and bushes. By day, they walk about, pecking for seeds, fruit, and insects. When danger approaches, such as a fox or snake, they freeze in place and let the predator pass, or they try to out-run it; but if need be, they leap into flight. Wing beats are fast, furious, and loud—a quail unexpectedly taking flight from underfoot is startling. An average flight lasts 5 seconds and covers 150 feet, after which the bird returns to ground. 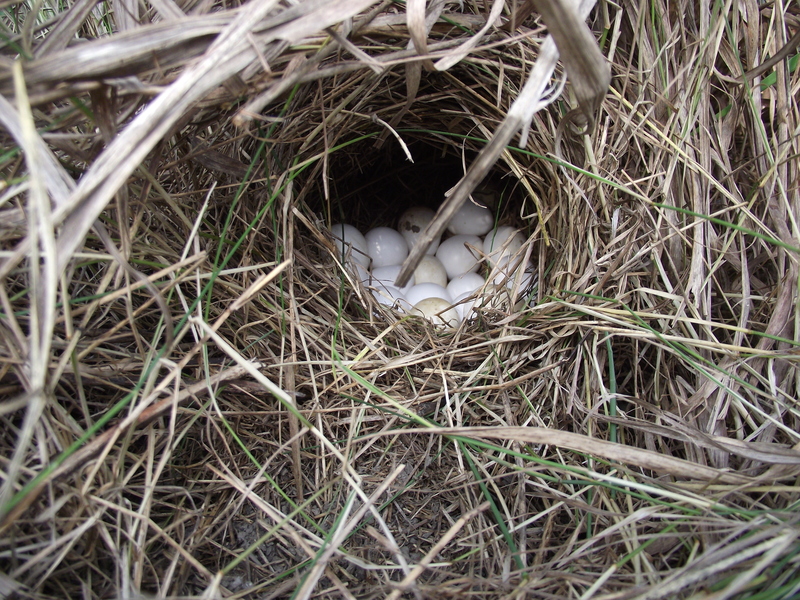 Quail nest 1-3 times per summer, laying on average 12-14 eggs per clutch. 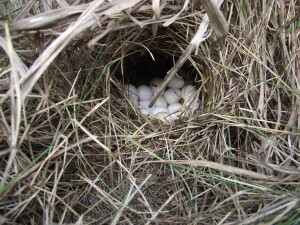 Nests are hidden under weeds or grass clumps. The hen may incubate the eggs herself and raise the young, but this job may also be done by the male; in this case, the female is free to find another male for a new nest. Incubation lasts 23 days. Hatchlings weigh ¼ ounce, yet they are able to walk and follow their parent within an hour of hatching. They look like walking, downy fuzz balls. They first fly when 2 weeks old and reach adult size in 3–4 months. 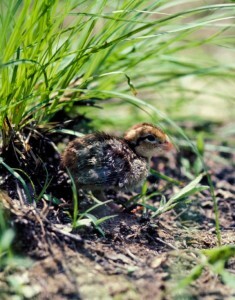 During the breeding season, quail live alone or with their chicks. 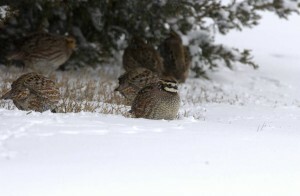 But once breeding is over, generally by September, quail unite into small flocks with 3-20 members. We call the flocks “coveys.” Membership in the covey is not fixed and some individuals move from covey to covey. A covey roosts at night with members in a circle, shoulder to shoulder, facing outwards towards danger. Coveys communicate with other coveys using a special whistle call. The covey call is given at about 15 minutes before daylight. Great habitat supports about one bird/acre, and from a well-positioned listening spot, a person can sometimes distinguish 10 coveys speaking to each other in the predawn hour. Quail live short lives: fewer than 20% live to be a year old. A three-year-old quail is well past middle age, and a five-year-old quail is truly ancient. Predation is the leading cause of death. Cooper’s hawks relish the big-breasted adults. Even the eggs are sought after by predators. Large rat snakes can swallow every egg in a nest, and the parent quail too, if caught by the snake. Quail are highly productive breeders, which is nature’s way of handling the high predation. A female bobwhite. Photo: Ben Robinson. Maximum of 5 years; 80% die before they are 12 months old; most deaths due to predation.